Our Light storage test has relatively more sequential accesses and lower queue depths than The Destroyer or the Heavy test, and it's by far the shortest test overall. It's based largely on applications that aren't highly dependent on storage performance, so this is a test more of application launch times and file load times. This test can be seen as the sum of all the little delays in daily usage, but with the idle times trimmed to 25ms it takes less than half an hour to run. Details of the Light test can be found here. 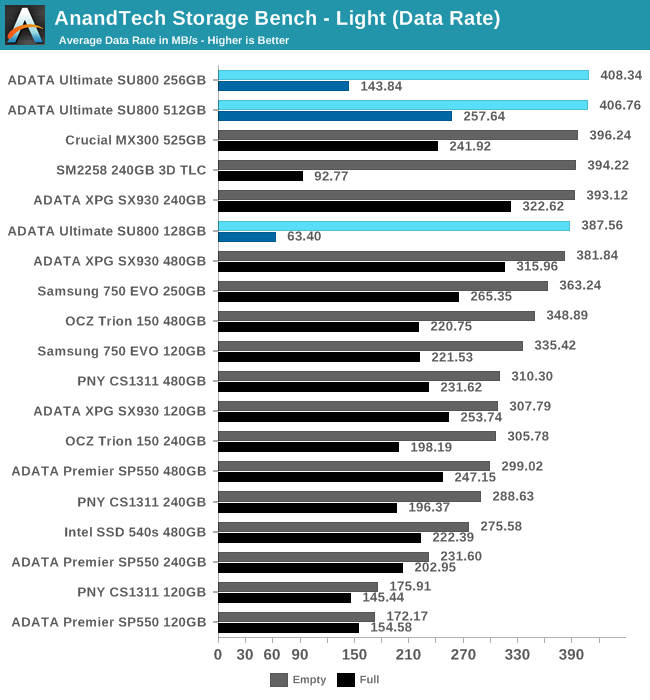 On the Light test, all three capacities of the ADATA SU800 perform quite well when the test is run on an empty drive. 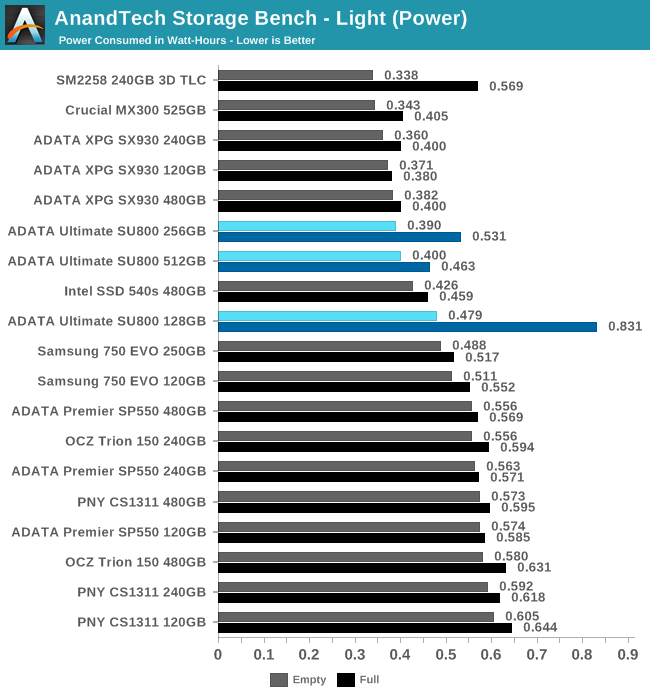 The performance penalty from running the test on a full drive is still huge, though the 512GB SU800 doesn't fall behind all of its competition. 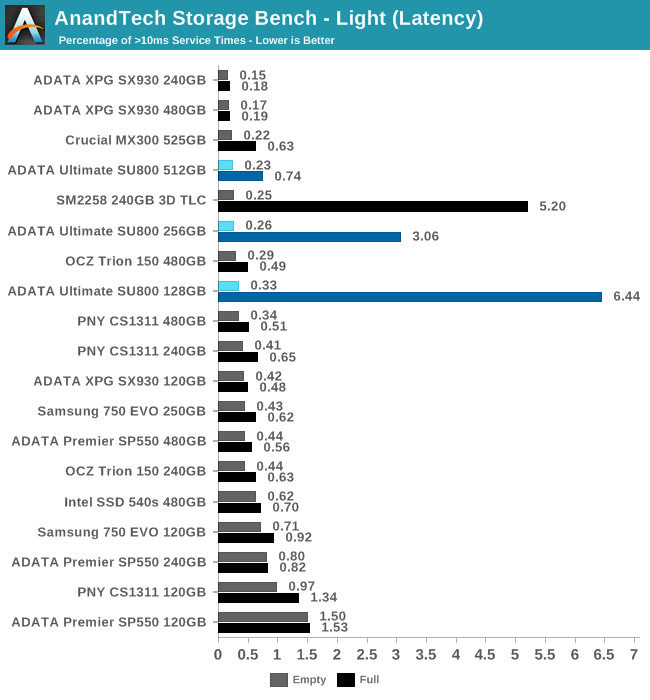 The smaller capacities of the SU800 have trouble keeping latency under control when full, but otherwise the average service times are normal for budget SSDs. The percentage of operations that require more than 10ms to complete shows us that the high average service times when full are due to a very high number of outliers, rather than just a uniform slowing of operations. Thanks to their good performance, the SU800s use less energy than most of the competition over the course of the light test, though the slightly slower Silicon Motion engineering sample with more overprovisioning and earlier firmware was a bit more efficient. 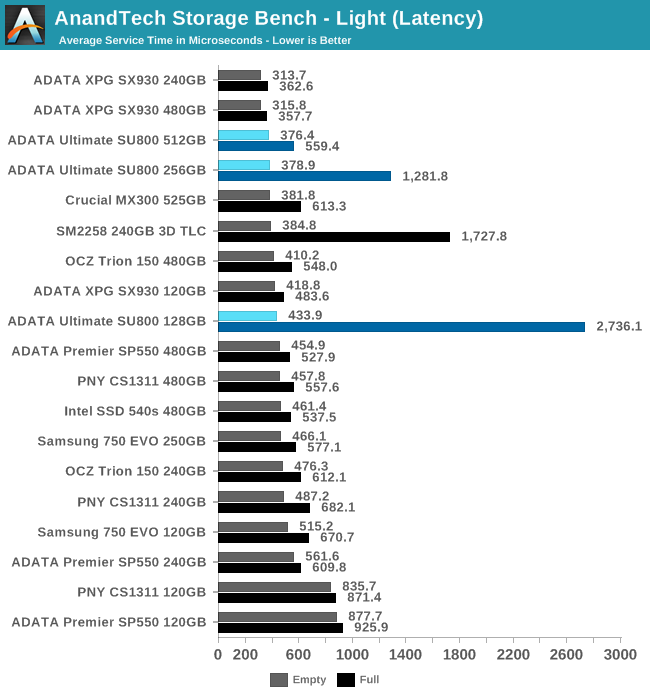 Why do you guys continually fail to mention the Mushkin Reactor 1TB MLC drive ($240 at Newegg) in your SSD comparisons? It's cheaper, faster, and probably has greater endurance. You reviewed it two years ago but have hardly mentioned it since then. It seems to be a "best buy" still. That's too bad, as some context would be useful, especially considering that many people own that drive, and until recently it was still being made.